When you look at a rainbow there is nothing “there” — what you see is only in your brain. We react to the differing reflectivity of light and interpret it as color. It really doesn’t pay to get too deep into the question of whether color is real or not. As far as we are concerned in our working life it’s a matter of getting ink on paper so that it will look like the object we are trying to represent. Imaginary colors, just like imaginary numbers, tend to do no more than make my mind spin. Whether a bee sees that red rose in exactly the same way that you do almost doesn’t matter (even if we had any way of comparing) — we have agreed to call the particular reflectance of light coming from it “red”; so red it is. One favorite pitfall in getting the mind around color is the additive/subtractive axis. Ink on paper is subtractive; color on your computer monitor is additive. This seems at first blush to be the wrong way round: after all when you add “cyan” and “magenta” to the yellow you get black, not the white paper you started with. However we are talking here about the reflection of light when we make this distinction. Subtractive color starts with white light and by adding filters (subtracting the wavelengths filtered out) causes us to see colors. If there are no pixels on your computer screen it will be black: adding red, green and blue pixels will make it white. 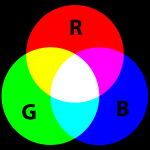 The fact that our eyes contain rods for distinguishing three colors leads to our using the handy trick of representing a colored object in print by a series of dots in the three subtractive primary colors, cyan, magenta and yellow. As we can see from the color diagrams above, where they overlap they print as black. 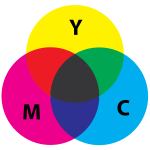 However not only is the resulting black not especially strong on the press, but the problem of hitting register spot-on means that it was an obvious good idea to add black ink to the process, giving us the four process colors, CMYK (Cyan, Magenta, Yellow, blacK) which are used now to represent most images in color printing, and of course the accompanying text. Avoid trying to print type as a four-color build: registration on press will inevitably let you down. Ensuring that a printed picture looks like the original is a revoltingly complex business. Now that pages are created on computers we have added a subtractive/additive element to the problem. People tend to fall in love with the print-out from the computer, and wrestling with the file to get the CMYK version coming off the press to match this must be consuming sizable amounts of the profit of the more demanding publishers. At Macmillan USA we had a color proofing room painted in the neutral grey and using the light source agreed by the industry to be the “standard”. This might mean that the proof really did match the original photo, but nobody could drag the whole room to the museum where the original painting hung in order to check how closely that matched the photo, and thus the proof. And of course you can hardly demand that your readers only look at the finished book in a room lit by the same standard light source and painted the same grey.